The demand for energy has risen relentlessly over the last 150 years in line with industrial development and population growth. And as economies of developing countries like China and India continue to grow, it is predicted demand will rise by a further 50% by 2030. President Bush has already warned the United States that it is too reliant on oil, often from "unstable" countries, and that it must find alternatives. Geologists are searching in Arctic Alaska, around the Falkland Islands and under the oceans for the last remaining sizeable reserves of oil. But what will happen if the fuel crisis is not resolved? Blending drama and documentary, the IF series returns with a film investigating a scenario many experts fear will come true. When the cheap oil we depend on starts to run out, we may not be able to take anything for granted any more. It is 2016 and the world is in crisis. Global supplies of oil cannot keep up with soaring demand and the price of petrol is going through the roof. The oil companies are in a desperate race to find any remaining oil reserves but what happens if there is no more out there? Combining expert interviews with a fictional story line, the drama-documentary examines how our lives will change as the price of fuel starts to spiral out of control. The film interweaves the story of Jess, an exploration geologist working for an international oil company, with the impact of the fuel crisis on her parents back home in Minneapolis. Instability in the Middle East has caused an "oil shock" and the price of crude is rising day by day. At the start of the film it is around $85 (£45) a barrel - in spring 2006 it is about $65 (£34) - but by the end of the drama the price has climbed to $160 (£85). As the story unfolds, expert interviewees - including Paul Domjan, Former Energy Security Adviser at the US Dept of Defence, oil analyst Matt Simmons and the legendary former Saudi Arabian Minister of Oil, Sheikh Yamani - explain how the crisis will have an effect on every part of our lives. We will not just be paying a lot more - £2.35 per litre or $5.88 per US gallon - to fill up our cars, we will be charged much higher prices for food, heating and light. Long distance travel will become increasingly expensive and we will even think carefully before using the car for what we used to regard as routine trips to the shops. As the economy goes into recession, Jess's parents find their world collapsing around them. Her father is the proud owner of a sport utility vehicle (SUV), but he has to put it up for sale as the running costs are just too high. The daily trip to the shopping mall becomes prohibitively expensive and then, as recession starts to bite, he loses his job as a truck driver with a haulage company. 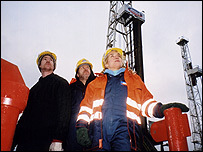 Meanwhile Jess's London-based oil company has been given permission to drill the first wildcat oil well in the Arctic National Wildlife Refuge. It is a controversial decision as the vast stretch of tundra in the north east corner of Alaska is the last untouched wilderness in the whole of North America. 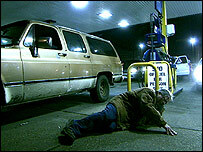 Back in Minneapolis, Jess's father becomes the victim of a road rage attack, all because of the price of petrol. He is beaten up and seriously injured after an argument in the queue at a gas station. As one of the experts concludes: "It is very important for us to think today about what we can do to move away from the oil age, to build a more environmentally sustainable economy without all the political and environmental problems that come with oil. "And hopefully we'll develop a policy to move away from oil today, rather than waiting until a story like this in 2016 forces us to give up oil."